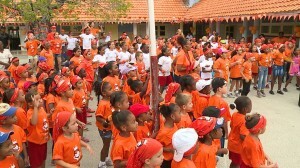 WILLEMSTAD - This year, more than 17,000 children from Curaçao are participating in the King Games. Since the inauguration of Willem Alexander as King of the Netherlands on April 30, 2013, the King's Games have become an annual event. The games are held on the last Friday prior to King's Day. So this year on April 20. The King's breakfast and King's Day are the permanent parts of the King's Games.